James Franco lip syncing to Justin Bieber’s “Boyfriend.” No, really. Yes, it’s awesome. This literally made my day. James Franco and his new lady friend, Ashley Benson (this is me pretending like I know who that is), for no reason at all, made this “music video.” He posted it to his WhoSay channel (again, this is me pretending like I know what that is) and took it down pretty quickly. My bet is he’s afraid of the Beliebers……… which, if you didn’t know, are Justin Bieber fans. Fun fact: my website is belieber.wordpress.com, and I made it before Justin Bieber ever existed. And the reason for that is because my last name IS LIEB so people nicknamed me Belieber. JUSTIN BIEBER STOLE MY NICKNAME. Not ok with it. 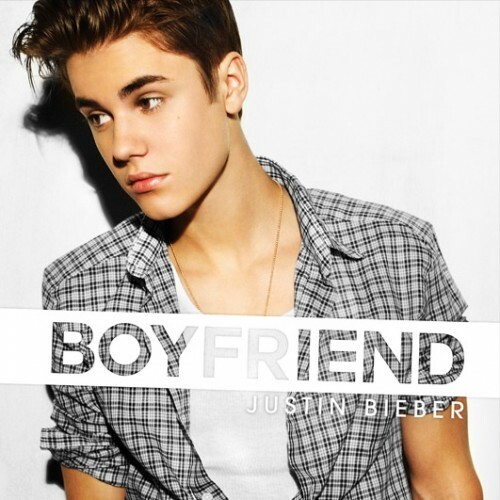 Justin Bieber’s new song “Boyfriend” sounds like Justified, no? #1, THIS IS A DAMN CATCHY SONG. #3, Doesn’t he sound just like Justin Timberlake, especially on his debut album, Justified? Especially with little guitar twang when he’s hitting those high notes. reminds me a lot of Like I Love You…. no? I mean, the songs are totally different. I’m not saying it’s a rip off (it’s not) but it seems very INSPIRED BY. This is Carly Rae Jepson…. a Canadian (GASP!) that Justin Bieber just signed to his record label. And yes, apparently Justin Bieber has a record label now. But yeah, basically ummmmm THIS IS GONNA BE MY NEW SHOWER ANTHEM. At least for this week while I make myself hate the song by playing it 400 times on repeat until the sound of it makes me die a little inside. That video up there is the original video…. once it got 25 MILLLLLION views on YouTube, they made a *legit* video, one that actually features the girl singing it…… not that that’s important or anything. You can watch that one down here. There’s something creepy seeing Justin Bieber & Chris Brown rap “she wax it all off, Mr Miagi” to a crowd full of screaming 11-year-old girls. I mean…………………………………really? I can see another teeny bopper wanting to come on stage at a Bieber concert if the crowd was their typical fan base. But yeah, no. Not the case here. Very weird. A “Make a Wish situation” is my new favorite term. Jason Sudeikis is hosting the MTV Movie Awards on Sunday, so he’s been doing his talk show rounds. Last night he was on Jimmy Kimmel Live! and they talked about when they were on opposite teams in the NBA All-Star celebrity game. 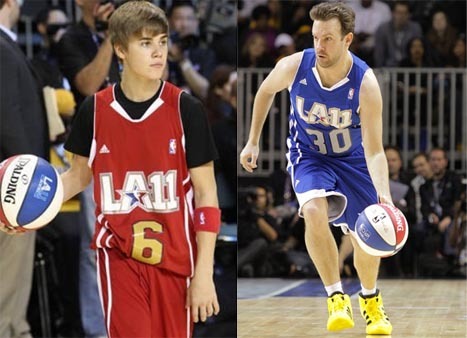 Justin Bieber played in that game (and won MVP), and was on Jimmy’s team. BWAAAAAAAAAAAAHAHAHAHAHAHAHA. I shouldn’t laugh. But seriously, THAT IS FUNNY. Rebecca Black interview addressing all the cyberbullying that I have willfully contributed to. Rebecca sat down with some random women from ABC and talked about her sudden rise to fame and all the hater comments. She thinks she’s being cyberbullied, and I’m pretty confident I contributed to that. LOL at 2:58, her mom saying, “In all honest I probably could’ve killed a few people” …. hopefully the people you kill are the producers of the song. Because they deserve it. She sings a few bars of the national anthem and sounds OK doing it, but I bet it would sound better with some autotune adjustment, featuring T-Pain.